313 pages | 8 B/W Illus. Tensions between central authorities and subnational units over centralization and fiscal autonomy are on top of the political agenda in many developing federal countries. This book examines historical changes in the balance between the resources that presidents and governors control and the policy responsibilities they have to deliver. It focuses on Argentina and Brazil, the most decentralized federal countries in Latin America, with the most powerful sub-national governments in the region. Using formal modelling, statistical tools, and comparative historical analyses, it examines substantive shifts in the allocation of resources and the distribution of administrative functions and explains under which conditions these changes occur. In doing so, it presents theoretical and comparative implications for the study of fiscal federalism and the functioning of developing federal democracies. 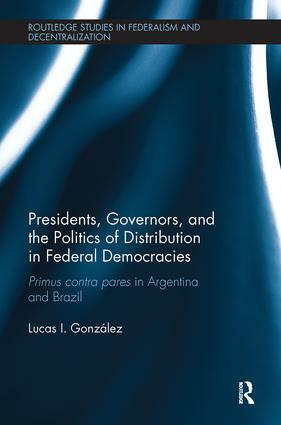 This text will be of key interest to scholars and students of federalism, intergovernmental relations, decentralization, and sub-national politics and more broadly to those studying comparative politics, democratization, political elites, public policy and economics. Lucas Gonzalez is Researcher at the National Council for Scientific and Technical Research (CONICET) and the Universidad Católica Argentina (UCA), and full-time Professor at the Universidad Nacional de San Martín (UNSAM) in Buenos Aires, Argentina.